The Renewable Fuel Standard (RFS) is a great American success story. It has helped provide consumers with real choice and savings at the pump while strengthening our economy, delivering greater energy independence, and improving our environment. The RFS has broad, bipartisan support in Congress and among state leaders. It has injected much-needed competition into the market, ensuring that homegrown fuels can reach consumers at the fuel pump since its enactment under the Energy Policy Act of 2005 and expansion under the Energy Independence and Security Act of 2007. Efforts to repeal or change the RFS would undermine that progress, make the U.S. more dependent on foreign oil, and increase gas prices. Moreover, it is vital that the Environmental Protection Agency (EPA) continue to meet the statutory biofuel targets set by Congress for annual Renewable Volume Obligations (RVOs), ensuring that America remains a global leader in renewable energy. On November 30, 2017, EPA released the final renewable volume obligations (RVOs) for 2018. The total renewable fuel volume is 19.29 billion gallons, which includes 15 billion gallons for conventional biofuel. 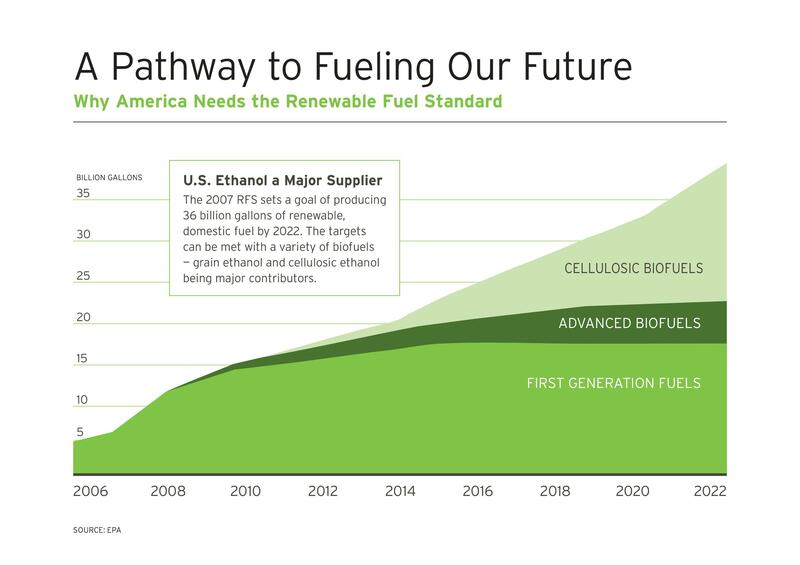 Advanced biofuel is set for 4.29 billion gallons, including 288 million gallons of cellulosic biofuel. The 2019 biodiesel amount is set for 2.1 billion gallons. Leading up to the release of the final 2018 RVOs, Growth Energy filed substantive comments including several studies that provided insight into the potential for cellulosic biofuels production, the role of renewable fuel in achieving the U.S.’s energy policy goals, and the risk of an increase to national greenhouse gas emissions if the EPA were to reduce the conventional fuel volume. Growth Energy Vice President of Regulatory Affairs, Chris Bliley, also testified during the EPA’s hearing in August on the RVOs. The RFS has worked for over 11 years with gasoline refiners and importers as the obligated parties to ensure that biofuels cannot be locked out of the market. Unfortunately, some refiners have sought to rewrite key elements of the RFS to avoid their obligation under the law. One such attempt has been to shift the point of obligation and ultimately the responsibility of complying with the goals of the RFS. The attempt would have shifted from refiners and importers to downstream players such as fuel retailers. The change would have imposed a major regulatory burden on hundreds – if not thousands – of fuel retailers and distributors, leading to higher consumer costs and fewer renewable options at the pump. In February 2017, Growth Energy released an expert economic analysis that identified numerous problems associated with changing the RFS point of obligation. This analysis was part of the association’s comments to EPA highlighting how a shift in point of obligation would be detrimental to growing the renewable fuels marketplace and would ultimately undermine an energy policy that has cut oil imports and reduced transportation-related emissions. On November 22, 2017, the EPA announced its final decision to keep the point of obligation unchanged. Thanks to the RFS, ethanol is now blended into 97 percent of our fuel supply, and production of homegrown biofuels supports economic growth across the heartland. In fact, America is a global leader in ethanol production, an industry that supports nearly 360,000 U.S. jobs and added nearly $44.4 billion to the nation’s gross domestic product. Ethanol is an earth-friendly biofuel that reduces greenhouse gas emissions by an average of 43 percent, according to the U.S. Department of Agriculture, and this percentage continues to increase with ongoing innovations in technology. Ethanol also protects our health by displacing toxic chemicals in gasoline associated with groundwater contamination, smog, asthma, and cancer. By providing an affordable alternative for foreign oil, ethanol helps to hold down prices and shields U.S. drivers against efforts by hostile nations to manipulate global energy prices. In fact, ethanol now meets more than 10 percent of our motor fuel needs and has helped America cut our dependence on oil imports in half since 2005, when the RFS was first enacted. The RFS creates competition at the pump, ensuring that consumers have cleaner, more affordable options when fueling up. As a result, U.S. drivers save money on fuel – as much as $1.50 per gallon during the last spike in global oil prices. Consumers also appreciate that higher biofuel blends can deliver more octane for better performance and help to reduce toxic emissions in the air. The RFS also stimulates investment in second-generation biofuels that can reduce greenhouse gas emissions by 100 percent or more over gasoline. This technology creates value from the waste portion of crops left in the field, while displacing even more carcinogens in gasoline.